More information on the Green Building Opportunity Index, including profiles of the cities and the specific criteria used in the rankings, is available at the BetterBricks website. How Do State Energy Programs Stack Up? The American Council for an Energy-Efficient Economy (ACEEE) has released a report exploring the apparent inconsistency in evaluation approaches for various energy efficiency programs. A National Survey of State Policies and Practices for the Evaluation of Ratepayer-Funded Energy Efficiency Programs found "great diversity in the policy framework, administrative structure, and technical details across states in their approach to evaluation; but overall, a high level of state regulator commitment to evaluation." Even so, the study also found that the variability in evaluation approaches across states doesn't change the fact that energy efficiency programs are highly cost-effective. In January, the U.S. Green Building Council (USGBC) released its 2011 list of top 10 states for LEED-certified commercial and institutional green buildings per capita. The rankings consider total LEED-certified square footage in the states for 2011 and U.S. 2010 Census numbers. Topping the list is Washington, D.C. with 31.5 square feet of LEED-certified building space per capita, followed by Colorado, which ranks as the top state, with 2.74 square feet per capita. Rounding out the top five slots are Illinois, Virginia and Washington, in that order. The per capita aspect of the rankings focuses on a crucial aspect of green buildings: the human element. Instead of ranking states by total number of LEED projects or cumulative square footage of LEED-certified structures, USGBC opted to look at per capita rankings to measure the spread of LEED in each state and how much exposure residents have to energy efficient and healthful LEED-certified spaces. 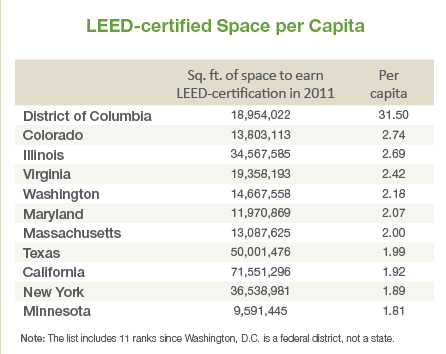 Washington D.C.'s substantial lead in per capita LEED-certified square footage reflects several points: One being that while the District is a small geographic area compared to U.S. states, it packs in a substantial amount of green buildings due to large-scale leadership from the government. The federal government owns and operates some 500,000 buildings, and nearly 30 percent of all LEED projects are government-owned or occupied. Additionally, Washington's residential population is small compared to the number of buildings it contains. This is due to the commuter population from Virginia and Maryland. Green building success in D.C. and the top states reflects a fundamental industry shift toward sustainability and green building. A key engine behind this shift is governmental action. Policies and incentives that encourage green building and LEED-certification are facilitating big changes on local and state-wide scales. Washington was the first city in the United States to require new construction building projects to earn LEED certification in tandem with its Green Building Act of 2006. Arlington County in Virginia and New York City are also examples of cities and localities with forward-thinking green building policies that facilitate state-wide success. This type of advocacy and governmental action at the city and state level, coupled with the spread of green building techniques and technologies, has resulted in market transformation. The green building market grew to include as much as 35 percent of non-residential construction starts in 2010, up from two percent in 2005 and 12 percent in 2008, according to McGraw Hill Construction's "Green Outlook 2011: Green Trends Driving Growth." The states in the top 10 list are at the forefront of this transformation, and are leading the charge. The announcement of the top 10 states for LEED-certified green building came shortly after USGBC broke the news that total square footage for LEED-certified existing buildings (LEED-EBOM) projects eclipsed new construction. The announcement underscores the fact that the country's greatest potential for cutting energy use and curbing emissions comes from our existing building stock.